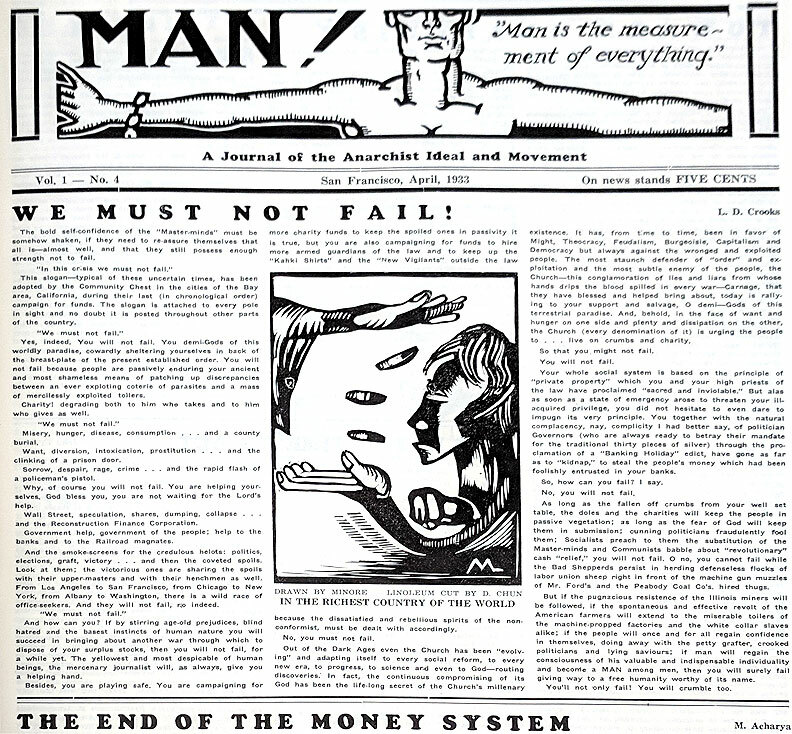 Originally published on page one in Man!, Vol. 1, No. 4, April 1933, San Francisco, California. The bold self-confidence of the “Master-minds” must be somehow shaken, if they need to re-assure themselves that all is—almost well, and that they still possess enough strength not to fail. This slogan—typical of these uncertain times, has been adopted by the Community Chest of the Bay Area, California, during their last (in chronological order) campaign for funds. The slogan is attached to ever pole in sight and no doubt it is posted throughout other parts of the country. Yes, indeed. You will not fail. You demi-Gods of this worldly paradise, cowardly sheltering yourselves in back of the breast-plate of the present established order. You will not fail because people are passively enduring your ancient and most shameless means of patching up discrepancies between an ever exploiting coterie of parasites and a mass of mercilessly exploited toilers. Charity! Degrading both to him who takes and to him who gives as well. Misery, hunger, disease, consumption . . . and a county burial. Want, diversion, intoxication, prostitution . . . and the clinking of a prison door. Sorrow, despair, rage, crime . . . and the rapid flash of a policeman’s pistol. Why, of course you will not fail. You are helping yourselves. God bless you, you are not waiting for the Lord’s help. Wall Street, speculation, shares, dumping, collapse . . . and the Reconstruction Finance Corporation. Government help, government of the people; help to the banks and to the Railroad magnates. And the smoke-screens for the credulous helots: politics, elections, graft, victory . . . and then the coveted spoils. Look at them: the victorious ones are sharing the spoils with their upper-masters and with their henchmen as well. From Los Angeles to San Francisco, from Chicago to New York, from Albany to Washington, there is a wild race of office-seekers. And they will not fail, no indeed. And how can you? If by stirring age-old prejudices, blind hatred and the basest instincts of human nature you will succeed in bringing about another war through which to dispose of your surplus stocks, then you will not fail, for a while yet. The yellowest and most despicable of human beings, the mercenary journalist will, as always, give you a helping hand. Besides, you are playing safe. You are campaigning for more charity funds to keep the spoiled ones in passivity it is true, but you are also campaigning for funds to hire more armed guardians of the law and to keep up the “Kakhi Shifts” and the “New Vigilants” outside the law because the dissatisfied and rebellious spirits of the non-conformist, must be dealt with accordingly. No, you must not fail. Out of the Dark Ages even the Church has been “evolving” and adapting itself to every social reform, to every new era, to progress, to science and even to God—routing discoveries. In fact, the continuous compromising of its God has been the life-long secret of the Church’s millenary existence, it has, from time to time, been in favor of Might, Theocracy, Feudalism, Bourgeoisie, Capitalism and Democracy but always against the wronged and exploited people. The most staunch defender of “order” and exploitation and the most subtle enemy of the people, the Church—this conglomeration of lies and liars from whose hands drips the blood spilled in every war—Carnage, that they have blessed and helped bring about, today is rallying to your support and salvage, O demi-Gods of this terrestial paradise. And, behold, in the face of want and hunger on one side and plenty and dissipation on the other, the Church (every denomination of it) is urging the people to . . . live on crumbs and charity. So that you might not fail. Your whole social system is based on the principle of “private property” which you and your high priests of the law have proclaimed “sacred and inviolable.” But alas as soon as a state of emergency arose to threaten your ill-acquired privilege, you did not hesitate to even dare to impugn its very principle. You together with the natural complacency, nay, complicity I had better say, of politician Governors (who are always ready to betray their mandate for the traditional thirty pieces of silver) through the proclamation of a “Banking Holiday” edict, have gone as far as to “kidnap,” to steal the people’s money which had been foolishly entrusted in your banks. So, how can you fail? I say. No, you will not fail. As long as the fallen off crumbs from your well set table, the doles and the charities will keep the people in passive vegetation; as long as the fear of God will keep them in submission; cunning politicians fraudulently fool them; Socialists preach to them the substitution of the Master-minds and Communists babble about “revolutionary” cash “relief,” you will not fail. O no, you cannot fail while the Bad Shepherds persist in herding defenseless flocks of labor union sheep right in front of the machine gun muzzles of Mr. Ford’s and the Peabody Coal Co’s hired thugs. But if the pugnacious resistance of the Illinois miners will be followed, if the spontaneous and effective revolt of the American farmers will extend to the miserable toilers of the machine-propped factories and the white collar slaves alike; if the people will once and for all regain confidence in themselves, doing away with the petty grafter, crooked politicians and lying saviours; if man will regain the consciousness of his valuable and indispensable individuality and become a MAN among men, then you will surely fail giving way to a free humanity worthy of its name. You’ll not only fail! You will crumble too. Man! was published in the 1930s in Oakland and San Francisco by Marcus Graham (also known as Shmuel Marcus and Robert Parsons), a man who the government tried unsuccessfully to deport because he refused to reveal his true name or his country of origin. Held in contempt repeatedly by the courts and the Immigration service, in 1940 he served six months but after he was released the government gave up and he remained functionally stateless, living up to Man! 's claim that the editor was "a man without a country—and truly so, since the entire world is the only country he recognizes as his, and also that of every human being." In October 1927, the Emancipazione Group resolved to bring together the various segments of the movement. It invited members of all local anarchist groups to a large picnic where, according to L’Emancipazione’s description of the event, “they ate, they sang, they debated. Laughter and voices mingled in the air. The Spanish, Russian, Yiddish, French, Chinese and Italian, instead of the Discord of Babel, seemed to harmonize together. And English of course, but perhaps it is useful to note that it was only spoken by the undesirables of this country [that is, immigrants] and that there was no trace of natives?” At a formal meeting on December 3, representatives from Italian, Russian, Polish, Yiddish, and Chinese organizations established the International Group of San Francisco. Within a month, “some French-language comrades” and a “Mexican group in Berkeley” had also joined. 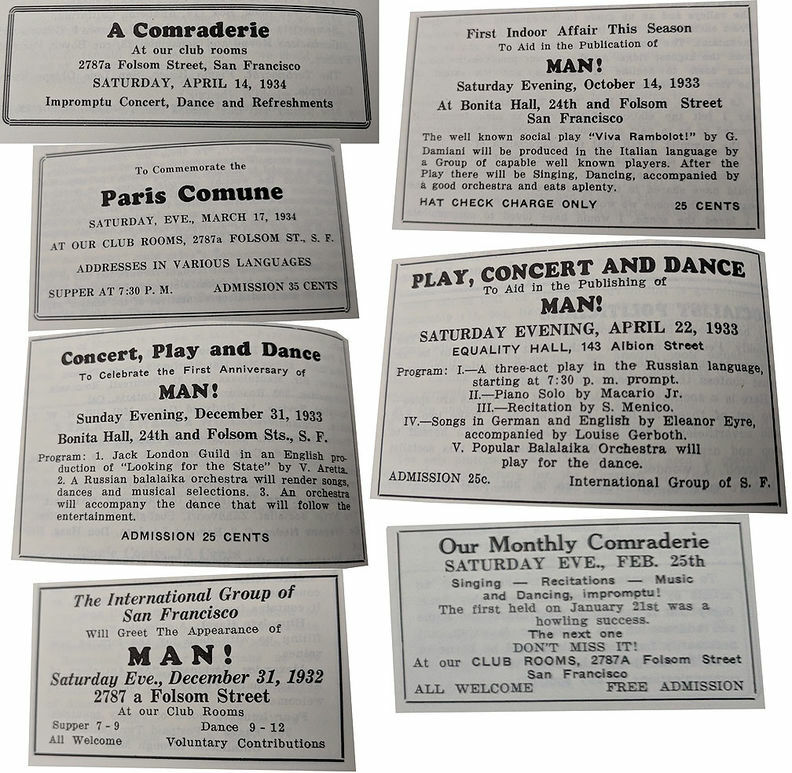 The Russian anarchists’ reading room at 2787 Folsom Street became the International Group’s “Club Rooms,” open to the public six evenings a week and hosting monthly “comraderies” featuring spaghetti, concerts, and dancing. The remarkable cosmopolitan atmosphere of the organization can be glimpsed in the program for an April 1933 fundraiser that featured a “three-act play in the Russian language,” a “piano solo by Macario Jr.,” a “Recitation by S. Menico [Domenico Sallitto],” “Songs in German and English by Eleanor Eyre, accompanied by Louise Gerboth,” and a “Popular Balalaika Orchestra.” Such boundary crossings were personal as well as political: Chinese member Eddie Wong and Polish Jewish member Bella Friedman married after meeting in the International Group. 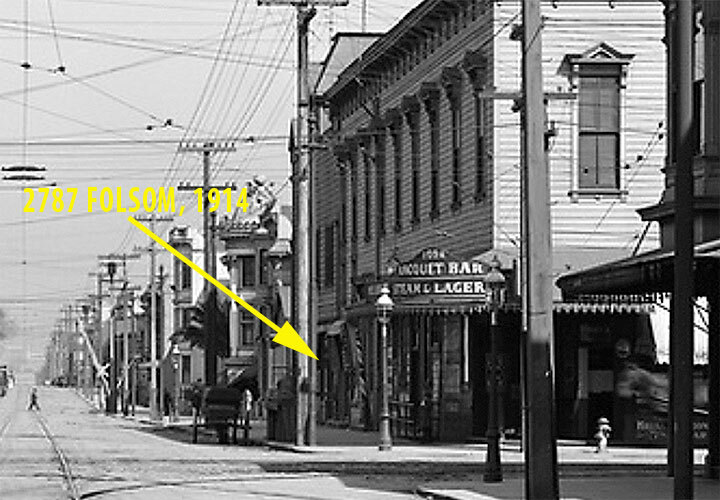 Multiple events held at 24th and Folsom in the early 1930s, and one on Albion Street, supporting Man! and the International Group of San Francisco. Northeast corner of 24th and Folsom, 1914. 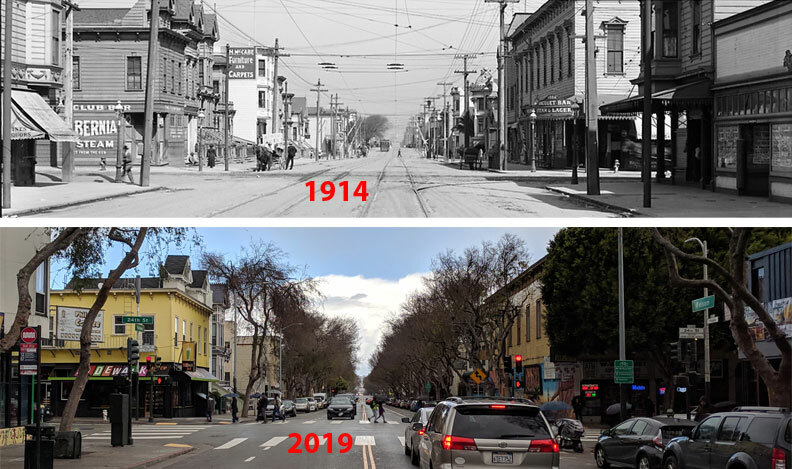 1914 and 2019, Folsom and 24th Streets.